In Chap. 1 a comprehensive review is provided for the classical development of supply chain contracts. 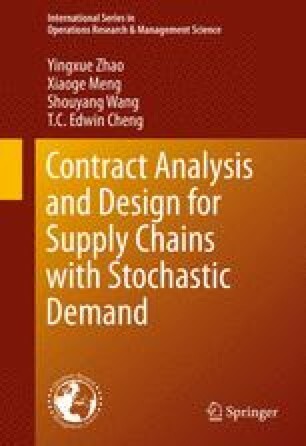 Given that the literature on supply chain contracts is vast and any categorization of research streams may not be enough to cover all, the review begins with the research under the classical newsvendor model and then covers various extensions. Particular attention is paid to the wholesale price contract, buyback contract, revenue-sharing contract, sales-rebate contract, quantity discount contract, and various flexible supply contracts. Such an organization of the contents aims to make the review follow a clear pattern and better capture the most important features of the past development on supply chain contracts. Besides, the main innovations for the research presented in this book are also summarized in this chapter.